There is nothing quite so moving as the energy emanating from hundreds of thousands of people moving as one, arms linked, voices raised in fierce determination. 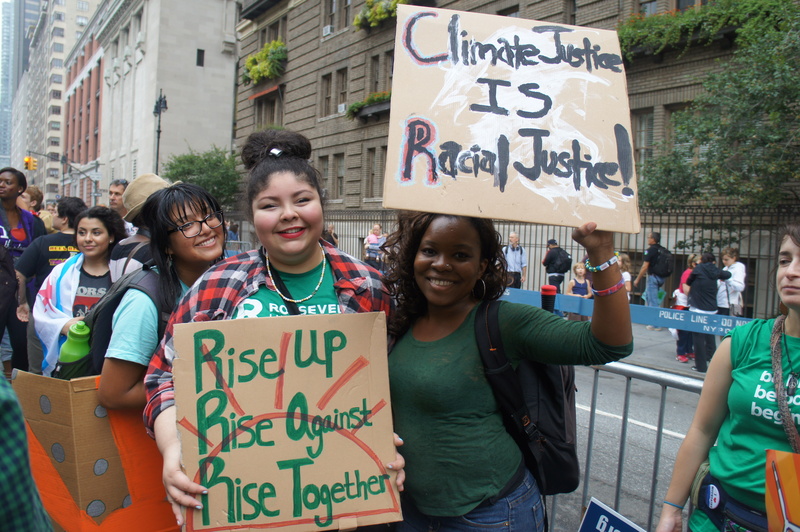 On September 21, 2014 more than 400,000 people mobilized at the People’s Climate March in New York City, breaking the record for the largest climate demonstration in history and making an unprecedented statement on the need for immediate and transformative action on climate change. Across the world, more than 2,646 additional events were organized in 162 countries, bringing more that 50,000 people to the streets of London, 25,000 to the streets of Paris, 2,000 to the streets of New Delhi, and thousands more to the streets of Bangladesh, Indonesia, Tanzania, and Burundi, to name but a few of the spectacular global actions. On the ground at the NYC People’s Climate March, constituencies from all walks of life united as one, creating powerful alliances both within and across groups representing indigenous and frontline communities, women, families, scientists, labor, youth, farmers, politicians, animal rights defenders, divestment campaigners, elders, peace activists, multi faith groups and more. In order to highlight the disproportionate effects that the climate crisis is already having on some sectors, Indigenous and frontline communities lead the march, followed by women and youth. In the cool morning mist, members and allies of the Women’s Earth and Climate Action Network (WECAN International) gathered to march as part of the women’s contingent. Under the bright green banner reading ‘Women for Climate Justice’, a group of women (and men!) of diverse backgrounds and ages began to grow until our meeting spot on the corner of 68th and Central Park West became packed and overflowing with excitement. The women’s delegation was honored to have Nobel Laureate Jody Williams, former Finnish President Tarja Halonen, and climate ambassadors from across the globe amongst the hundreds of incredible women who mobilized with us. Before beginning the march, WECAN International members and allies joined together in the street for the ‘Wall of Women’ action. Standing shoulder to shoulder, fists placed over the heart, the ‘climate women’ formed a line to represent their role as guardians of Mother Earth and their communities. On the sidelines taking photos, I was immediately struck by the beauty and power of this act of physical solidarity, which was echoed by international allies who submitted wonderful photos to our online photo gallery (wecaninternational.org/climate-march-2014-gallery). As the march began to surge forward, a wave of cheers rolled through the crowd and hundreds of colorful banners and hand made signs were hoisted into the air. Chants of “Women. Climate. We want justice now,” rose around me, lead by mega-phone wielding WECAN International co-Founders, Sally Ranney and Osprey Orielle Lake and allies from the Women’s Environment and Development Organization (WEDO). 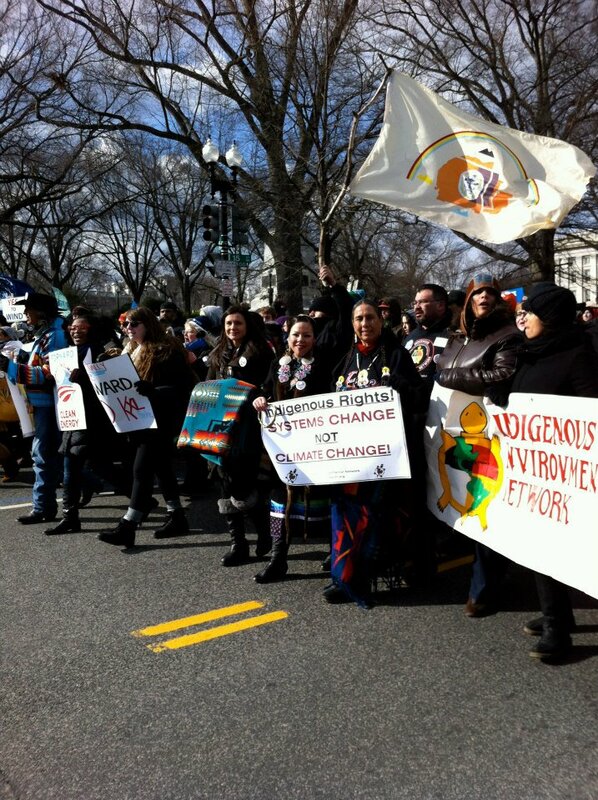 During the march, Executive Director Osprey Orielle Lake and members of the WECAN International team set off through the crowd to join Indigenous allies at the forefront of the march. There, in front of a beautiful paper-mache representation of Mother Earth, we caught up with Crystal Lameman of the Beaver Lake Cree Nation, Patricia and Nina Gualinga of Sarayaku Ecuador, Melina Laboucan-Massimo of the Cree First Nation, Casey Camp Horneik of the Ponca Nation, and Kandi Mossett of the Indigenous Environmental Network, who derives her heritage from the Mandan, Hidatsa, and Arikara peoples. Osprey Orielle Lake and Patricia Gualinga at the March. Photo by Emily Arasim, 2014. At the march to bring attention to the devastating impacts that extractivism and misconceived ‘development’ are having on their people’s culture and lands, it is these women who remind us everyday why we marched on September 21st, and more importantly, why this march is just the beginning. As we look forward from the historic People’s Climate March, we must remember these words and the stories of the indigenous women who live on the frontline everyday. The crisis unfolding around us demands that the People’s Climate March be but the first leap in our unrelenting mobilization for ecologic and social justice. We must do this, we will do this, WECAN do this. 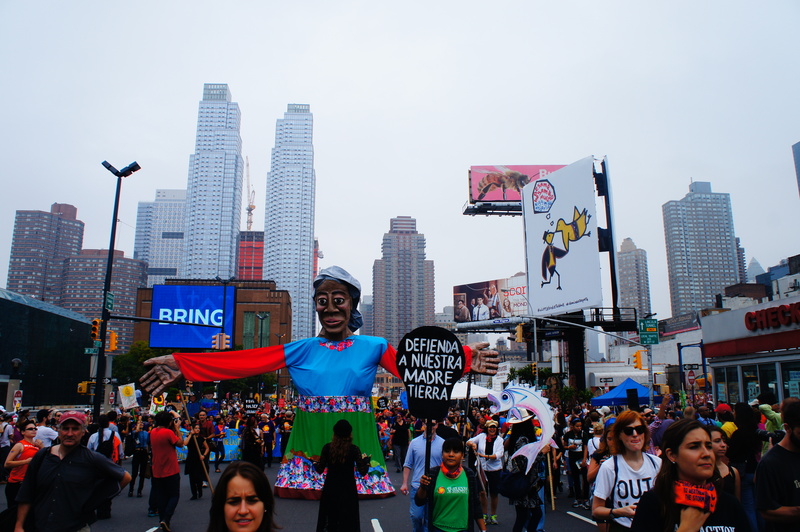 View the full ‘WECAN International at the People’s Climate March’ photo album here. Top international politicians, scientists, businesspeople, and civil society activists gather today in New York City for the 2014 United Nation Climate Leadership Summit. Convened by Secretary General Ban Ki-moon as a platform for world leaders to present and generate support for climate action proposals, the Summit is widely regarded as a critical ‘make it or break it’ moment in international environmental policy. Recognizing that the Summit represents a crucial tipping point, and that both political and grassroots efforts are needed for meaningful action, activists of many backgrounds and visions have united to mobilize and insure that UN leaders understand the imperative for immediate action. 400,000 people marched on the streets on New York Sunday and thousands held a sit-in the next day near Wall Street to let world leaders know people want climate justice and they want action now. After a week at the forefront of on-the-ground civil society actions surrounding the Summit, the Women’s Earth and Climate Action Network (WECAN International) will also be participating in the formal UN Summit beginning today. Selected as part of a small civil society delegation, WECAN International leaders Kandi Mossett, Fadoua Brour, Osprey Orielle Lake and Sally Ranney will attend the United Nations Climate Leadership Summit, strengthening the presence of women and front line communities, and drawing attention to women’s simultaneous climate vulnerability and unparalleled resiliency and leadership. During a time of political inaction, apathy, and neglect of climate issues, women, Indigenous and frontline leaders will be an unrelenting voice for the deeply intertwined issue of social and ecologic justice. Kandi Mossett currently works as the Native Energy & Climate Campaign Organizer for the Indigenous Environmental Network (IEN) and serves on the WECAN International advisory board. Deriving her heritage from the Mandan, Hidatsa, and Arikara peoples of what is now the Northern United States, Kandi has witnessed first-hand the impacts of the fossil fuel economy on indigenous peoples of the region. Ms. Mossett began her work with the IEN in 2007, working primarily with tribal youth to engage them climate justice initiatives, connect them to green job opportunities, and bridge the inter-generational knowledge gap between indigenous youth and the elders who possess skills and world views from a time of greater harmony between man and nature. Her local work is complemented by international advocacy work, including participation in several UN Fora, aimed at bringing visibility to the diverse social and ecologic justice movements blooming in indigenous communities throughout North America. Fadoua Brour is a climate activist from Morocco working as WECAN Internationals Regional Coordinator in the Middle East and North Africa (MENA) Region, in addition to roles as President/Founder of the Moroccan Youth Climate Movement and National Director of the Arab Youth Climate Movement. 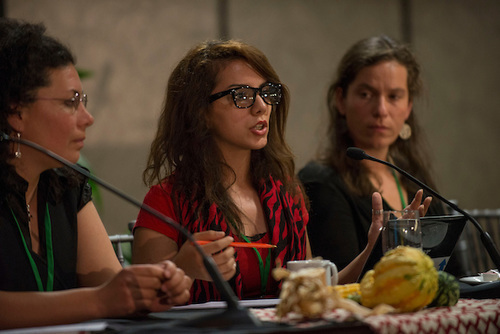 Fadoua has been at the forefront of groundbreaking initiatives to mobilize MENA region youth and women around the climate issue, leading caravans, media campaigns, workshops, and trainings. One of her central goals has been catalyzing critical discussion and leadership amongst the regions women who are already directly experiencing the effects of climate change, including desertification, erosion, and water scarcity. Under her leadership WECAN completed its first MENA Region Climate Solutions Training this past June. Sally Ranney is Co-Founder of WECAN International and Founder/ President of eraGlobal Alliance, with 30 years of professional experience in land, water, energy, sustainability, and biodiversity policy. Currently President of the American Renewable Energy Institute (AREI), Sally served as Co-Director of the Institute’s AREDAY Summit for three years. She is CEO of Stillwater Preservation LLC, a wetlands- mitigation banking company and serves as an Advisor to P4P Energy, an innovative solar energy company. A former Resource Policy Analyst for The Wilderness Society, Sally has served on the President’s Commission on American Outdoors, the Clinton transition team, and created a youth conservation corps. Osprey Orielle Lake is an author, activist, and co-Founder and Executive Director of WECAN International, working nationally and internationally to build resilient communities, move towards a post-carbon future, and address issues of societal transformation. She oversees and serves as an instructor for WECAN’s international climate trainings and directs WECAN’s advocacy work in areas such as Women for Forests, Rights of Nature, and UN Forums. She has additionally served on the board of the Praxis Peace Institute and on the Steering Committee for The UN Women’s Major Group for the Rio+20 Earth Summit. Her book, Uprising for the Earth: Reconnecting Culture with Nature, details the myriad of factors contributing to our current climate crisis, while also mapping out a strategy with which to overcome it. Please visit our blog again next week for post-Summit reflections from WECAN International attendees. Deriving her heritage from the Mandan, Hidatsa, and Arikara peoples of what is now North Dakota, Kandi Mossett of the Indigenous Environmental Network (IEN) has emerged as a leading voice in the fight to bring visibility to the impact that climate change and environmental injustice are having on Indigenous communities across North America. After competing her Master’s Degree in Environmental Management, Ms. Mossett began her work with the IEN as Tribal Campus Climate Challenge Coordinator, engaging with more than 30 tribal colleges to instate community based environmental programs, discuss issues of socio-ecologic injustice, and connect indigenous youth with green jobs. 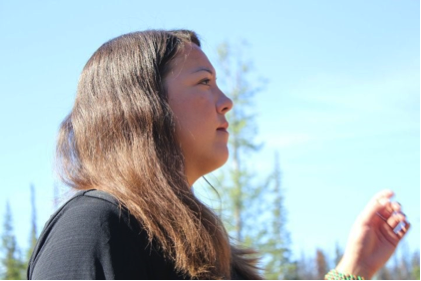 She currently serves as the IEN’s Native Energy & Climate Campaign Organizer, focusing at present on creating awareness about the environmentally & socially devastating effects of hydraulic fracturing on tribal lands. Her local work is complemented by international advocacy work, including participation in several UN Fora and a recent testimony before the U.S. Congress on the climate issue and its links to issues of health, identity, and well being on tribal lands. On Saturday, September 20th 2014, Kandi will be featured at ‘#FRACK OFF: Indigenous Women Leading Media Campaigns to Defend our Climate’, to be held in New York City as part of Climate Week 2014, the People’s Climate March, and the mobilization around the U.N. Climate Leadership Summit. At the event, Kandi and a panel of inspiring women will discuss the high profile media campaigns being conducted by Indigenous women in the US and Canada in reaction to the expanding fossil fuel industry and government incursion on tribal rights and sovereignty. The Women’s Earth and Climate Action Network (WECAN International) is extremely honored to have Kandi Mossett as a member of the WECAN Advisory Board. Women make up over half of the world’s population, produce more than half of all the food we eat, and form the backbone of familial and economic life. Around the globe, women’s daily work, paid and unpaid, connects them intimately with the Earth on which they depend to provide for their families and communities. Gender disparities reduce women’s physical and economic mobility, voice, and opportunity in many places, making them more vulnerable to the increasingly adverse impacts of climate change. While women continue to suffer disproportionately from environmental destruction and climate change, they also stand on the frontlines of global efforts to revision and heal our world. These women are rising with fierce resolve, aware that what is happening on climate change at the national and international policy level does not suffice given the social and ecologic crisis we face. These women, rising and implementing remarkable and effective works across the globe, wield immense power to change things for the better and are integral to genuine environmental justice. Women are already at the heart of food production, water and resource management, and household consumption decisions, making them uniquely poised to chart a new social, economic, and political course. A body of emerging evidence indicates that women’s leadership is essential to reducing carbon emissions and fostering environmental protections. Further, women united have an unmatched potential to promote cross-sectoral and cross-cultural exchange, and thus generate effective solutions. 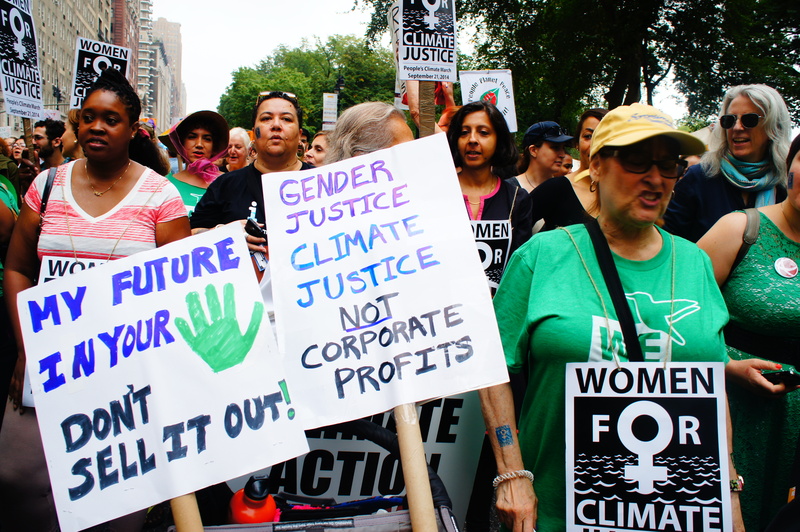 The Women’s Earth and Climate Action Network (WECAN International) was founded in response to the knowledge that we cannot achieve climate justice without gender justice. Towards this end, WECAN International works to engage women worldwide as powerful stakeholders in climate change and sustainability solutions, with varied on projects including Women’s for Forests and Fossil Fuel/Mining/Mega Dam Resistance, Regional Climate Solutions Trainings in the Middle East North Africa region and Democratic Republic of Congo, the Women’s Earth and Climate Summits, the Women’s Climate Declaration, and newly released Women’s Climate Action Agenda. 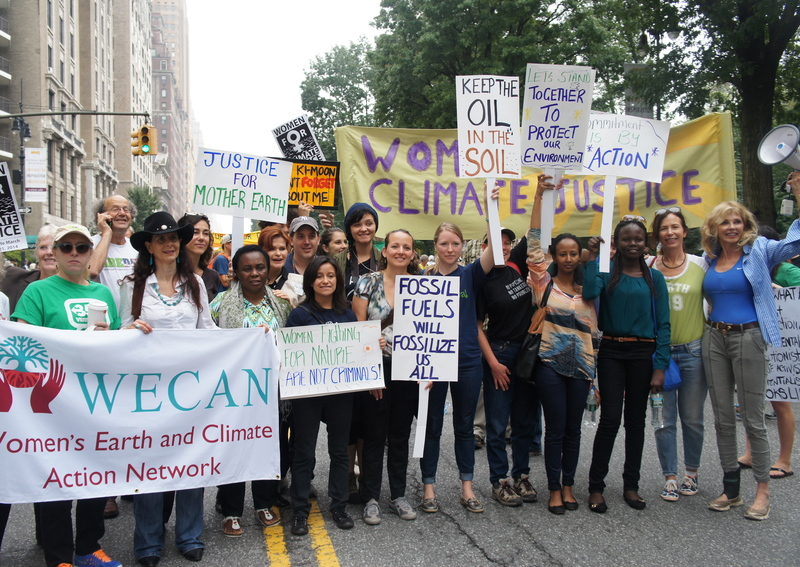 This September 2014, WECAN International will be on the ground in New York City working to strengthen the voice of women in the mobilization surrounding the United Nations Climate Leadership Summit, Climate Week NYC 2014, and People’s Climate March. On September 21, 2014, WECAN International will join hundreds of thousands of people across the world for the People’s Climate March, standing with the women’s delegation in order to bring attention to the critical role of women in climate leadership. At our ‘Women Leading Solutions on the Frontlines of Climate Change’ event on September 22nd, we will bring together some of the visionary women who are demonstrating first hand the ways in which women are central to climate justice and transformative change (wecaninternational.org/pages/climate-march-2014). The full list of event speakers and biographies can be seen by clicking here. Our ‘Wall of Women’ action on September 21st and 22nd is a chance for women around the world to unite and give voice to their local climate issues, solutions, and messages to world leaders. Submit photos and a statement about your Wall of Women Action at: wecaninternational.org/climate-march-2014-gallery. The Women’s Earth and Climate Action Network is honored to announce the participation of several WECAN International leaders and allies in the ‘Leaders’ Forum on Women Leading the Way: Raising Ambition for Climate Action’, event presented by by UN Women and the Mary Robinson Foundation for Climate Justice. The event, to be held September 22, 2014, will feature Michelle Bachelet, current President of Chile, five former women presidents and prime ministers, Queen Rania Al Abdullah of Jordan, Graça Machel, and the UN Secretary-General Ban Ki-moon, alongside women leaders from civil society organizations, frontline and Indigenous communities, and youth groups. A WECAN International delegation will attend the Forum and participate in roundtable discussions and panels. 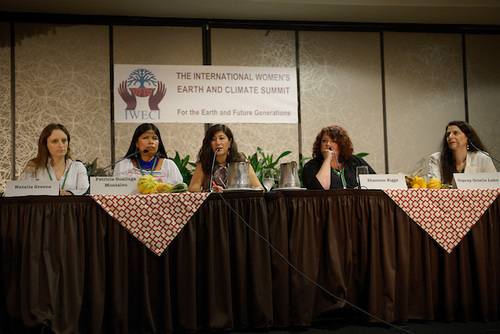 This group of outstanding women includes Patricia Gualinga, Kichwa leader of Sarayaku Ecuador; Crystal Lameman of the Beaver Lake Cree Nation, Treaty 6 Canada, and Sierra Club Canada; Esperanza Martinez of Acción Ecologica, Ecuador; Thilmeeza Hussien of Voice of Women Maldives, Carmen Capriles of Reacción Climática in Bolivia, and WECAN International Co-Founder and Executive Director, Osprey Orielle Lake. The Forum takes place one day before the UN Secretary-General’s Climate Change Leadership Summit, making it a crucial mobilization platform for highlighting the connection between gender equality, women’s leadership, and climate justice and solutions. From the Amazon Basin to Alberta, Canada, Indigenous women are leading efforts to halt environmental destruction and restore health and justice in their communities. 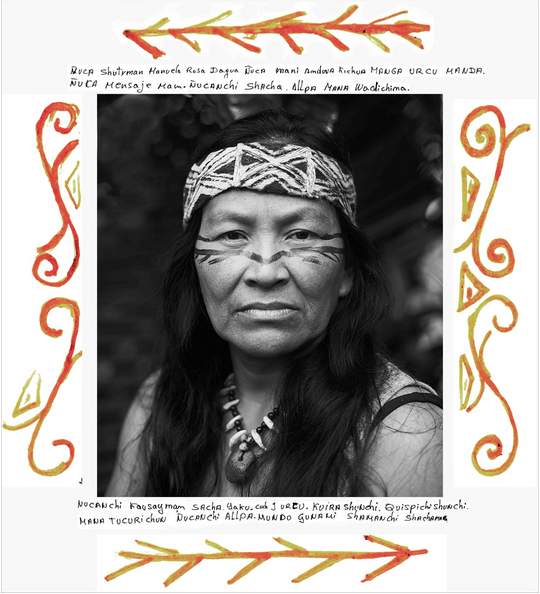 Patricia Gualinga Montalvo of Saryaku Ecuador, is one of the Indigenous women leaders on the frontlines of the movement to protect the Amazon. 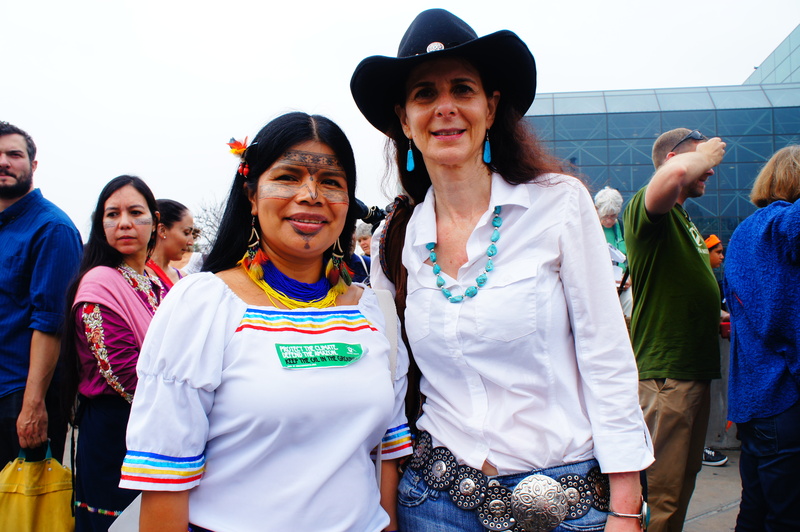 Known for her key role in the historic Indigenous rights victory at the Inter-American Court of Human Rights, which found the Ecuadorian government guilty of illegal oil concession, Patricia has fought ceaselessly to protect her homeland from the decimation wrought by the fossil fuel industry. 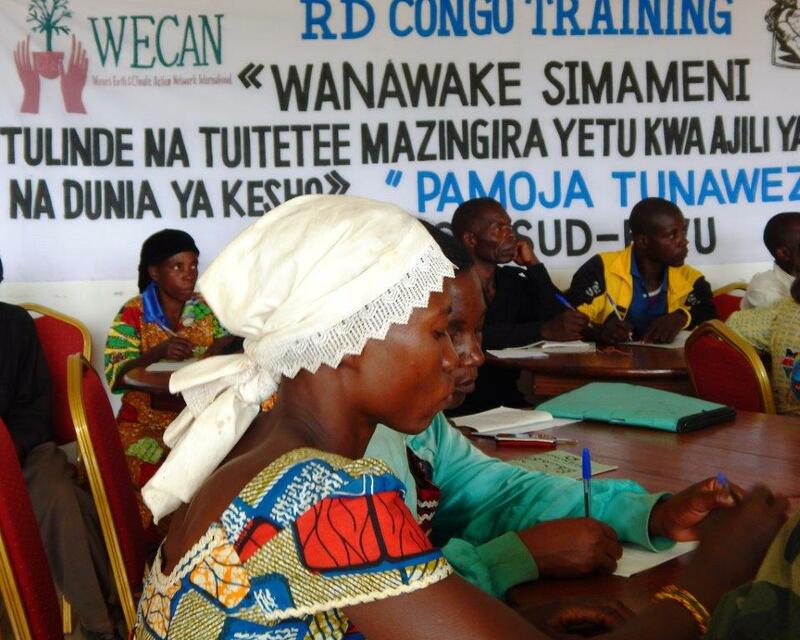 With Patricia’s guidance and that of our partner Amazon Watch, WECAN International has been working to support women’s media outreach and mobilization efforts in the region. As part of the Women for Forest Program, WECAN International is also honored to be working with Gloria Ushigua, President of the Association of Sápara Women of Ecuador. The Sápara have long organized to protect their territory, which includes over 300,000 hectares of the some of the most biodiverse and pristine rainforest in the world. The Sápara women have released declarations, participated in press conferences, and were crucial in the ‘March of the Women’ in October 2013, during which 100 Amazonian women walked over 300 miles to denounce the Ecuadorian government’s plans to auction off their ancestral land. WECAN International also continues to a support campaigns to stop oil exploration in Ecuador’s Yasuni National Park, a zone previously deemed ‘intangible’ due to its unparalleled biodiversity and unique cultural heritage, which is now being opened up to oil companies. This solidarity work included sponsoring and promoting an art exhibit in the capital of Quito, which documents the struggle of the Indigenous women who are defending the Ecuadorian Amazon from oil exploitation. 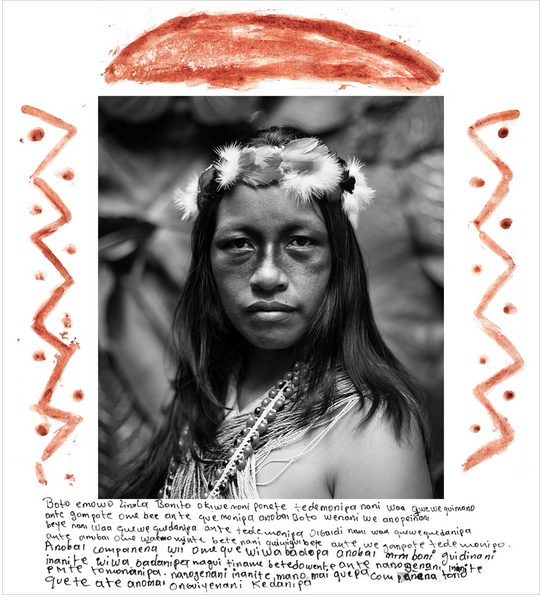 The words written on the images are self-reflections of the women´s lives, of their culture, history, traditions, and their reasons for fighting oil extraction in their ancestral lands. Thousands of miles away, the Indigenous First Nations women of Alberta, Canada are also rising to protect their land and the health and integrity of their communities from the destruction wrought by the fossil fuel industry. The women of Alberta have been at the forefront of the mobilization against the Keystone XL pipeline and expansion of the tar sands and its infrastructure, demonstrating the severe threat such projects pose to climate, land, water, and tribal rights. Crystal Lameman of the Beaver Lake Cree Nation is one such organizer, who tirelessly challenges the expanding industry. 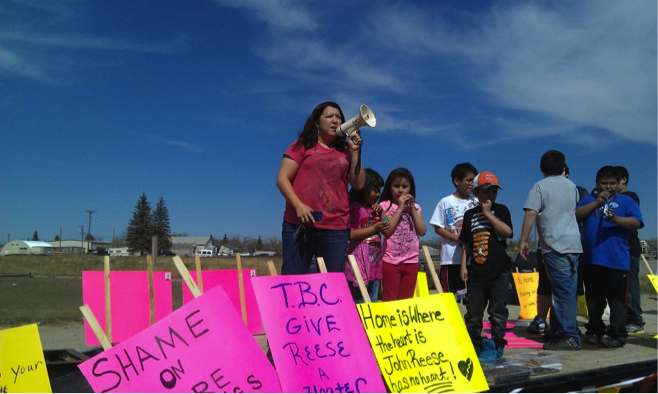 In May 2008, Crystal spearheaded a law suit against the Canadian Government, presenting to the court over 17,000 violations of Treaty 6, which guarantees her peoples the right to fish and hunt in their ancestral homeland. This right, negated by decimation of local ecosystems for tar sands development, is central to Ms. Lameman’s vigorous campaign to hold the government and corporate entities responsible for their exploitation of the tar sands, and the resultant destruction of the land, and her people’s heritage and livelihood.